Our (well used!) kitchen copy of Vegan on a Shoestring #2! We are just about out of copies of this cookbook to sell, but you can still download it for free under the "our recipe book" tag. Our brand new mugs! All mugs are printed with both images - one on either side. Our T-shirts! 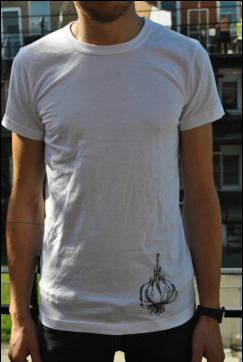 Garlic or spiced oil image, with the People's Potato logo on the back.